Pagan art in Palestine (and beyond) - PAU FIGUERAS , THE PAGAN IMAGE OF GRECO-ROMAN PALESTINE AND SURROUNDING LANDS (British Archaeological Reports International Series 2495; Archaeopress, Oxford 2013). Pp. iv + 252, figs. 935. ISBN 978 1 4073 1109 8. £39. 1 Republished in Avi-Yonah, M. (edd. Katzenstein, H. and Tsafrir, Y. ), Art in ancient Palestine (Jerusalem 1981). 2 I will mention just some of the most important studies. The best introduction to the archaeology of the area in Graeco-Roman times, but often overlooked in modern literature, is H. P. Kuhnen, with contributions by Mildenberg, L. and Wenning, R., Palästina in griechisch-römischer Zeit (Handbuch der Archäologie. Vorderasien 2, Bd. 2; München 1990). See also Fine, S., Art and Judaism in the Greco-Roman period: towards a new Jewish archaeology (Cambridge 2005); Hachlili, R., Ancient mosaic pavements: themes, issues, and trends (Leiden 2009). For the Hellenistic period, see Tal, O., The archaeology of Hellenistic Palestine: between tradition and renewal (Jerusalem 2009) [Hebrew]. 3 For Jordan, use of the Studies in the history and archaeology of Jordan would have been desirable. 4 The “Supplement” attached to the gazetteer includes objects of “undetermined” origin, which are thus superfluous due to their doubtful origin and useless for any further analysis. 5 For Hippos, only the reports up to 2005 are used, but see Segal, A., Schuler, M. and Eisenberg, M. (edd. ), Hippos-Sussita: eleventh season of excavations, July 2010 (Haifa 2010), and now Segal, A., Eisenberg, M., Młynarczyk, J., Burdajewicz, M. and Schuler, M. (edd. ), Hippos-Sussita of the Decapolis. The first twelve seasons of excavations 2000-2011, vol. I (Haifa 2013). 6 For Caesarea, see various important articles in A. Raban and Holum, K. G. (edd. ), Caesarea Maritima: a retrospective after two millennia (Leiden 1996); Patrich, J., Studies in the archaeology and history of Caesarea Maritima Caput Judaeae, Metropolis Palaestinae (Leiden 2011), with review by Dey, H. in JRA 25 (2012) 901–5. Also relevant to the themes of this book is Ayalon, E., The assemblage of bone and ivory artifacts from Caesarea Maritima, Israel, 1st-13th centuries CE (BAR S1457; Oxford 2005). 7 For Ascalon, see Fuks, G., A city of many seas — Ashkelon during the Hellenistic and Roman periods (Jerusalem 2001) [Hebrew]; for Scythopolis, see Fuks, G., Scythopolis — a Greek city in Eretz-Israel (Jerusalem 1983) [Hebrew]. 8 References to specific studies regarding those sites and to the question of the Hellenistic and Roman legacy in Early Islamic times would have been a great help to the reader: e.g., for Qusayr ‘Amra, H. Taragan, “Constructing a visual rhetoric: images of craftsmen and builders in the Umayyad Palace at Qusayr ‘Amra,” Al-Masaq: Islam and the Medieval Mediterranean 20.2 (2008) 141–60; or for Mafjar, id., “The peopled scrolls at the Umayyad palace in Jericho — some observations,” Assaph 3 (1998) 93-108; or for Mshatta, O. Grabar, “The date and meaning of Mshatta,” DOP 41 (1987) 243-47. 9 In addition to the works mentioned in n.2, Tsafrir, Y., Eretz Israel from the destruction of the Second Temple to the Muslim conquest, vol. 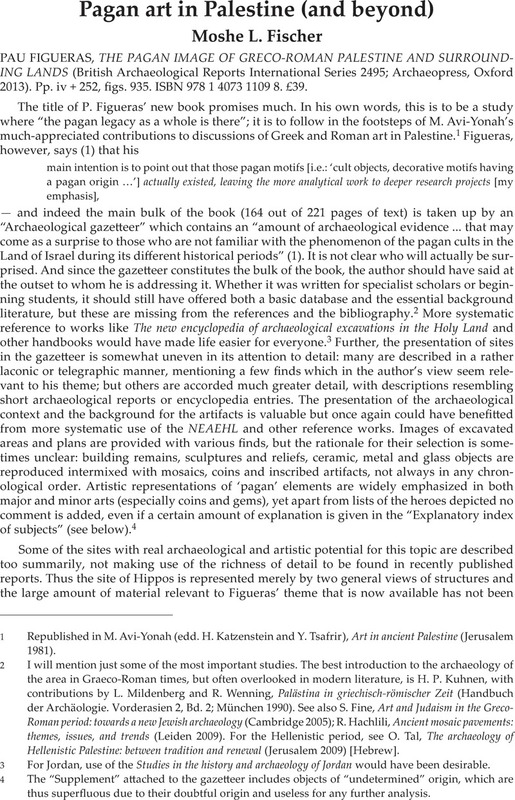 2: archaeology and art (Jerusalem 1984) [Hebrew], is still very useful, though unfortunately it has never been translated. 10 I mention just a few works dealing with these complex issues. On cultural interactions, see Champion, T. C. (ed. ), Centre and periphery: comparative studies in archaeology (London 1989); Hoff, M. and Rotroff, S. (edd. ), The Romanization of Athens (Oxford 1997). On acculturation and assimilation see Frankfurter, D., Religion in Roman Egypt: assimilation and resistance (Princeton NJ 1998); Scott, S. and Webster, J. (edd. ), Roman imperialism and provincial art (Cambridge 2003). For the particular Jewish case, see Levine, L. I., Judaism and Hellenism in antiquity: conflict or confluence? (Seattle, WA 1999). On ethno-archaeology more generally, see David, N. and Kramer, C. (edd. ), Ethnoarchaeology in action (Cambridge 2001). 11 Maps would have especially helpful to readers less familiar with the region. Most valuable are the gazetteer and maps in the TIR Iudaea-Palaestina: Tsafrir, Y., Di-Segni, L. and Green, J., Eretz Israel during the Hellenistic, Roman and Byzantine periods (Jerusalem 1994; still distributed by the Journal of Roman Archaeology). 12 Cf. Krencker, D. and Zschietzschmann, W., Römische Tempel in Syrien (Berlin 1938). 13 Figueras completely omits Omrit, for which see Overman, J. A. and Schowalter, D. N. (edd. ), The Roman temple complex at Horvat Omrit: an interim report (BAR S2205; Oxford 2011). 14 Emphasized in works such as Hajjar, Y., La triade d’Heliopolis-Baalbek: iconographie, théologie, culte et sanctuaires (Montréal, QC 1985). 15 See, e.g., various articles in Eliav, Y. Z., Friedland, E. A. and Herbert, S. (edd. ), The sculptural environment of the Roman Near East. Reflections on culture, ideology, and power (Leuven 2008), with review by Kropp, A. in JRA 23 (2010) 762–69.